The Japanese aesthetic known as wabi-sabi is influencing segments of western home decor. Shall we call it urban rustic? Wabi: humble, primitive, rustic and simple. Sabi: beauty in aging, imperfection; passing of time, transience, to rust. Wabi-sabi is helping me find a language to describe a fascination many of us have with beauty in natural aging and imperfection. Many of the Japanese arts over thousands of years, such as ikebana flower arranging and the tea ceremony, reflect the wabi-sabi aesthetic. “Intimately tied to Zen Buddhism, wabi-sabi can be embraced as an aesthetic sense, but it also brings a subtle spiritual component into the home. It reminds us that home could be a sanctuary, not a loud place full of disturbance and distractions. It asks that we set aside our judgments and our need for perfection and focus instead on the beauty of things as they are”, writes Robyn Griggs Lawrence, author of The Wabi-Sabi House. Years ago, while I was touring Guatemala, a small, sculptural branch on the rain forest floor caught my eye. I picked it up and brought it home (I know now that we don’t bring vegetation home from other countries!). I was amazed to watch the branch shrivel, curve and darken so much that it was not recognizable as the original piece that I brought home. To this day I marvel at the transformation. 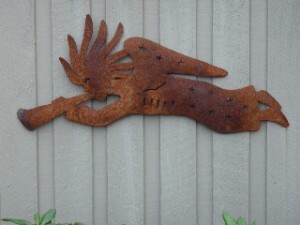 Outside our front door, below the light fixture and house numbers, hangs a metal, trumpet-blowing angel. Over the past few years we’ve watched the finish turn to shades of orange rust. More recently I noticed that lower down on the wood siding is a wisp of the rust colour. In previous years I would have been quick to paint over it and consider that a mistake. Now I’m leaving it as part of the story of the rusty angel transforming in west coast weather. 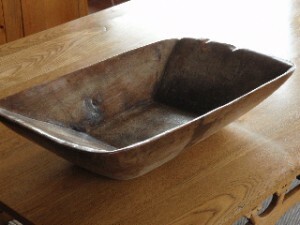 Our family inherited a rectangular, wooden bowl used for kneading dough. There is much evidence of decades of loving use in the feel and patina of this vessel. Most of the bowl is shiny and smooth though it has rough places on the rim where it may have been dropped in years gone by. The aging of this piece has a dynamic quality which prompts our reflections. When studying the empty basin we found that the carver had not achieved having the flat bottom be exactly parallel to the sides of the rim. We commented on how disappointed the carver must have been after all the work of hand carving this large bowl. Upon reflection we realized that imperfection doesn’t affect the original function, in fact, it adds charm and humour to the overall affect. The family enjoys it in the centre of our dining room table. This summer I invite you to slow down and reflect on the unique beauty in the natural world. Perhaps you will be spending time at a beach, the forest or in the mountains. Be aware of the beauty revealing itself as you are drawn to reflect on cracks, crevices, evidence of weathering and signs of time passing. While appreciating beauty in these places know that the ancient wabi-sabi-aesthetic is quietly showing the way. Let’s slow down and have a wabi-sabi summer. Jan Laurie lives in Nanaimo. She is a hand drummer and percussionist and also has a passion for interior re-design and home staging. 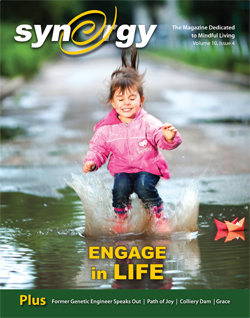 This entry was posted on Sunday, July 26th, 2009 at 10:40 am	and is filed under MINDFUL LIVING. You can follow any responses to this entry through the RSS 2.0 feed. You can leave a response, or trackback from your own site.